These are polar stratospheric clouds (PSCs), and they require temperatures around -85ºC to form. "Today, heavy rainclouds and a bitter wind greeted the people of Tromsø in northern Norway when they woke up. 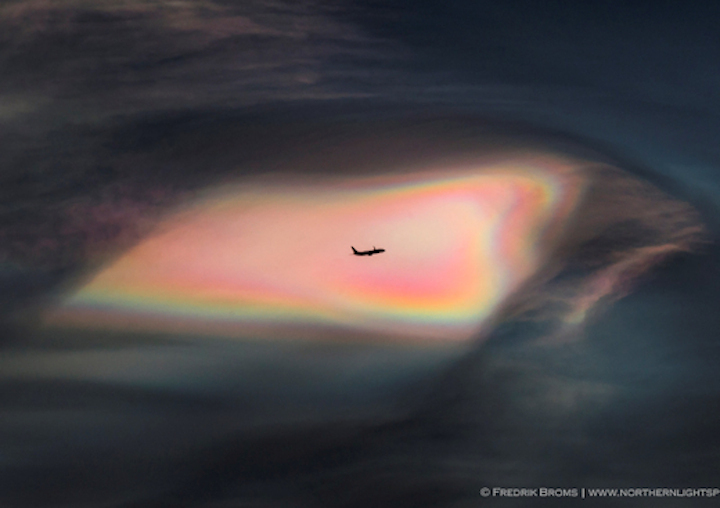 But all of a sudden, the clouds parted and the sky cracked open to reveal an absolutely stunning display of stratospheric clouds high above the ordinary gray rainclouds," says photographer Fredrik Broms. "Seldom have I seen PSCs with such vivid colours as today." The stratosphere is extremely dry, which makes it hard for clouds of any type to form. Only when the air up there becomes extremely cold do widely-spaced water molecules coalesce to form ice crystals--the "stuff" of PSCs. High-altitude sunlight shining through these ice particles produces the clouds' characteristic bright iridescent colors. Today's sighting in Norway and a related sighting in Sweden marks the beginning of the 2017-18 winter season for polar stratospheric clouds. Stay tuned for more.